This is a mod compilation between my CostumeCraft and Borisr55's chicken suit mod, so please dont say that I stole this idea from him. Chestplate - 1st Row "FOF" 2nd Row "FBF" 3rd Row "FFF"
Pants - 1st Row "FFF" 2nd Row "FOF" 3rd Row "BOB"
Shoes - 2nd Row "FOF" 3rd Row "BOB"
Helmet - 1st Row "BBB" 2nd Row "BOB"
Chestplate - 1st Row "BOB" 2nd Row "BBB" 3rd Row "BBB"
Pants - 1st Row "BBB" 2nd Row "BOB" 3rd Row "BOB"
Shoes - 2nd Row "BOB" 3rd Row "BOB"
Helmet - 1st Row "PPP" 2nd Row "POP"
Chestplate - 1st Row "POP" 2nd Row "PPP" 3rd Row "PPP"
Pants - 1st Row "PPP" 2nd Row "POP" 3rd Row "POP"
Shoes - 2nd Row "POP" 3rd Row "POP"
Note: This is a SINGLE PLAYER mod only. YEAH!! HALLOWEEN IS COMING!!! So, send me some skins that you want to be made into a costume BEFORE October 31st and ill see to it k? 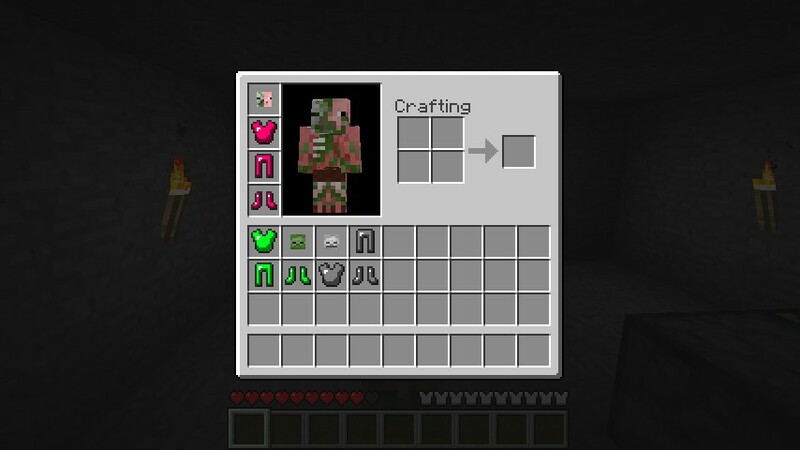 why make a helmet for skeleton and zombie if it has a head in vannila? I gave the development to someone else, PM kimeriderf for details on this. can you add creeper costume? 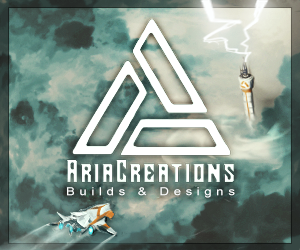 Yeah i will soon, im just making a few new things and ill add the new update soon. You should make it so that when you're wearing a costume, the mobs of that type have a lesser chance of spotting/attacking you. make a frickin Pumpkin zombe like in the skins now! Send me a link of the skin please! Try and get modloader, and send me a link! cuz for me its Halloween and I wanna make a haunted house with heads! Dude.... STUPID MOD! the head's should be place able!!!!!!!!!!!! >:( I AM NOT HAPPY WITH THIS STUPID RETARTED MOD! how is the mod retarded just because you can't place the heads? I'm having issues with this mod. 1. It doesn't allow me to drag/drop crafted items into my inventory. That includes costumes as well as things such as wood planks. The list above doesn't craft any costume. 1. Removed bin dir and relauched Minecraft.exe to download clean minecraft.jar. Then closed Minecraft client app. 2. Installed ModLoader 1.7.3, following the directions, from http://www.modloader.com/minecraft-modloader-1-7/. 3. I checked to make sure Minecraft still functioned as expected, paying particular attention to the crafting functionality. 4. Installed the Costume mode, following the directions above. 5. Started up Minecraft 1.7.3 client again and logged into my local server. Has anyone experienced these issues? Well first of all, are you doing this on a server or single player? This is NOT Multiplayer Compatible. And are you using the real version of minecraft and not the fake one? Ah. I didn't notice that it was a single player only mod. I mentioned using this on my "local server" in step #5. BTW: Just so I know for future reference. Is there some place where it states that the mod is single player only? I don't see anything on this page. Does this works for smp? Currently, no, but i am trying to learn how to make mods for smp, if you can find some advanced modder to help teach me, please tell me about he/she. the costume for the zombie head is a white box with "gt" on the top and bottom? is this some sort of prank? No, did you put the stuff inside the "Put in Armor" inside the armor folder? 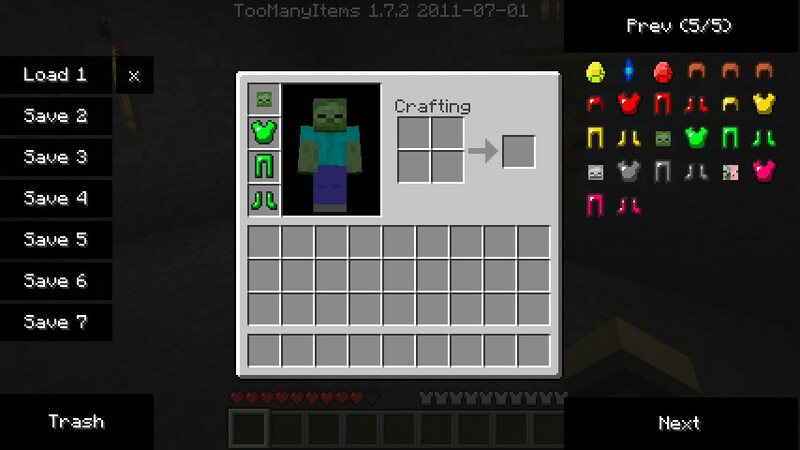 whats that mod yur using that has the list of itemsa dn blocks when u look in yur inventory? 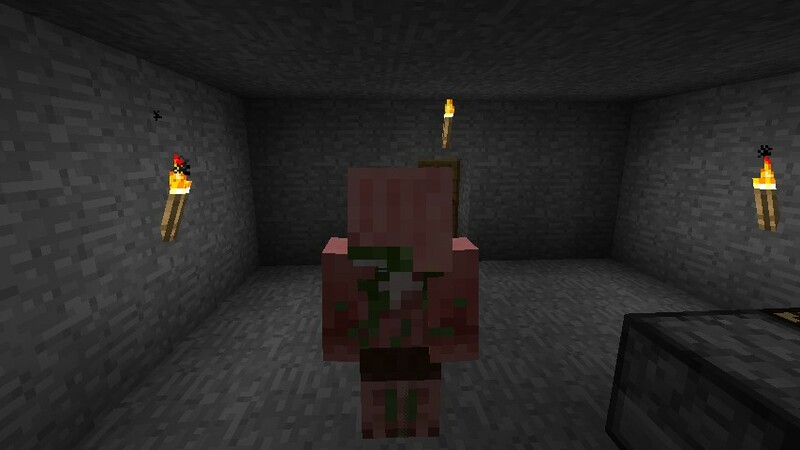 hey if you could make it so that other mobs see you as that mob (eg if you had zombie costume on, no mobs would attack you unless you attacked first) THAT WOULD BE EPIC!!! awesome mod! i dare somebody to built this mod into a server and then see how many people mistake them for the mobs they are dressed as and freak out. it wont work! PLZ HELP ME! Does the costume makes you "friendly" to the enemie mobs??? [1.2.5] VehicleCraft v.1.1.0 - Now with multiple colors! 1.2.0 Out Tomorrow! [1.0.0] Tables and More! *HUGE UPDATE! * V.1.3!